These gluten-free, dairy-free baked breakfast treats are a hybrid of a fluffy, tender biscuit and sweet, flaky scones … but with a bit of muffin texture sass to them. I’ve made Orange Zest Chocolate Chip Scones in the past, and I really like how they turned out. For that recipe I used a baking flour mix that produced delicious results. I encourage you to give those a try, if you’ve not done so already. So why share another very similar recipe? For a couple reasons. 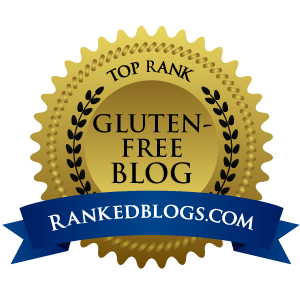 I know some of you prefer to use individual gluten-free flours instead of mixes, or (have someone like me) try different blends and mixes from time to time. 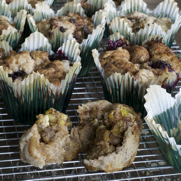 Also, I’m moving away from using xanthan and guar gums in as much of my baking as possible … I just don’t like the way they make me feel and most recipes don’t require their inclusion … These two types of gums are often included in gluten-free baking mixes. The recipe mentioned above falls into both of those categories. So I did some tweaking and came up with this new recipe, with the same taste-bud pleasing flavors, while substituting psyllium husk for the xanthan (included in the mix) and using only a small portion of a gum-free flour blend in the total flour quantity required. Very nice results from the adaptations. 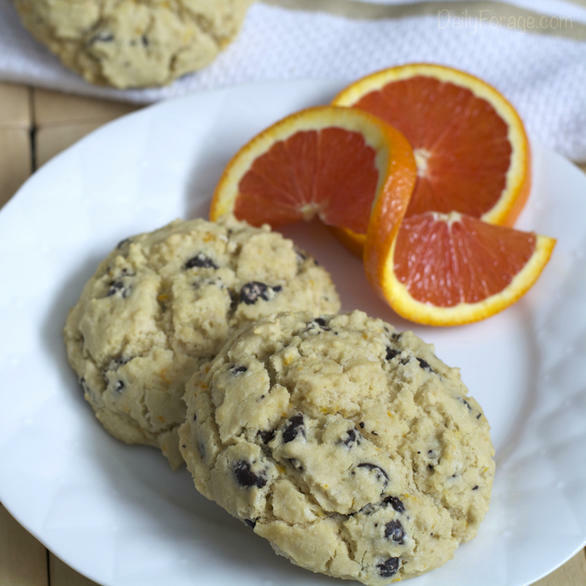 The chocolate and orange flavors come through without being overpowering. Since these scones, as the ones above, have been adapted from a 1996 Cooking Light recipe, they are low in fat, sugar, and salt. 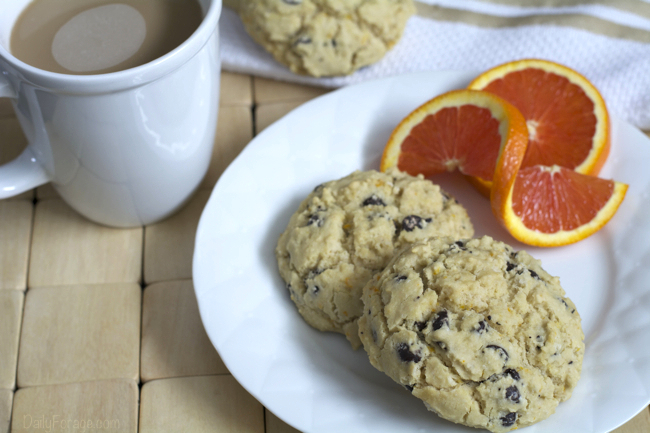 A simple, delicate breakfast treat that pairs perfectly with a cup of strong tea or your favorite coffee. 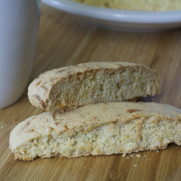 These gluten-free, dairy-free biscuit scones are also free of egg, soy, and peanut allergens. And doesn’t orange zest and its essence brighten up the colder winter months? Preheat oven to 400ºF and place rack in center of oven. Line a baking sheet with parchment paper. Set aside. In a large bowl, combine flours, sugar and psyllium husk. Sift in baking powder and cream of tartar. Add orange zest, then whisk to combine. Cut butter substitute into dry ingredients using either a pastry cutter, two knives, or your fingers. I prefer working the "butter" and flour between my fingertips to get the best texture. Do so until flour resembles coarse meal. Stir together "milk", vinegar, and vanilla in cup then pour into flour mixture. Stir well to combine, then stir in chocolate chips. Scoop 8-9 balls of dough using a large scoop (#20), or about the size of a scoop of ice cream, into a ball and place them onto a parchment-lined baking sheet, leaving space between them. Bake at 400ºF for 14-16 minutes, or until lightly golden on top. Transfer parchment with scones onto cooling rack and let rest 3-4 minutes, then remove from parchment paper and continue cooling on rack until room temperature. Store in resealable, airtight container for up to 3 days on countertop. You’re quite welcome. Thanks for taking time to share your thoughts.